Image: the entrance of the Bing Cave. Fee: Adults EUR 3, Children (5-14) EUR 1.50, Kurkarteninhaber EUR 2.50, Students EUR 2.50, Families (2+4) EUR 7.50. Groups (15+): Adults EUR 2.50, Children (5-14) EUR 1.50. Special tour (1-3 pers) EUR 10. Dimension: L=270m, T=12°C, A=380m asl. Guided tours: L=270m, D=40min, V=44,700/a . 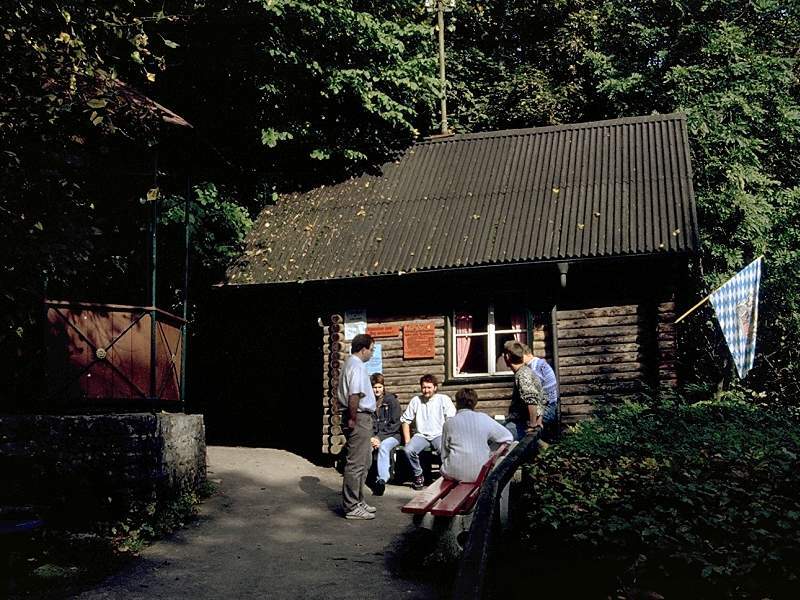 Address: Touristinformation Muggendorf/Streitberg, Forchheimer Straße 8, 91346 Wiesenttal, Tel: +49-9196-19433, Fax: +49-9196-929930. 1905 excavation by Ignaz Bing, discovery of the cave. 1905 opened to the public. 1936 discovery of another 100m passage and construction of the artificial exit. 2004 cave completely redone, fences removed, new electric light, new ticket office. 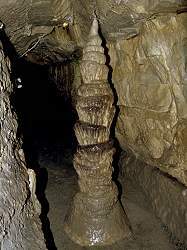 Image: the stalagmite Riesensäule (Giants' Column). During excavations in a small cave above Streitberg in 1905, the remains of human settlement were found: fire places and potsherds. Other findings were bones of various animals, buffalo, deer, and more. Surprisingly no cave bear (Ursus spelaeus) remains were found. After removing some meters of cave sediments, a continuation of the cave was discovered. The excavation was conducted by the Geheimer Kommerzienrat (Privy Councillor) Ignaz Bing from Nürnberg. The new cave was called Bing's Cave to his honour. Because of its size and beauty it was developed immediatley and opened to the public in the same year. Electric light was installed only two years later. 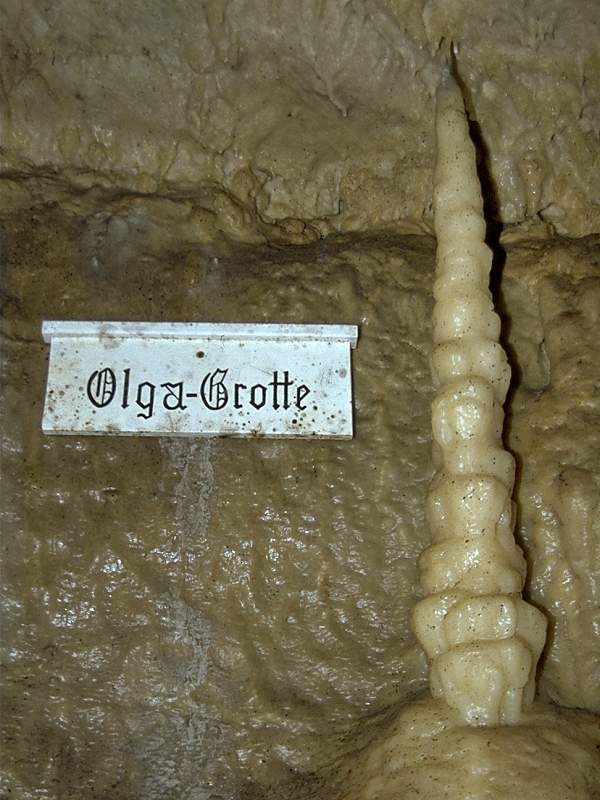 Image: a stalagmite in the Olga-Grotte (Olga's Grotto). This is the only show cave in the Franconian Jura, which is not located in Dolomite. It formed in layered limestone, which was deposited between two sponge reefs. The different chemistry and mineralogy of the rock results in a much different character of the cave, compared to the other caves of the area. A single passage of more or less constant width and height runs through the rock for about 270m. It was formed by an ancient cave stream, probably during the Ice Age. The melting water of the glaciers drained through the cave system to a resurgence in the Wisent valley, which was less deep than today. When the valley was deepend by the erosion of the Wisent river, the ground water went deeper, the cave river dried up and the cave became a so called fossil cave or dry cave. The whole cave shows an impressive amount of speleothems, most of them white, but also in various shades of brown. Extraordinary are the calcite crystals which can be found all over the cave. There are several water marks built of calcite crystals, which are formed when water stands very calm in a pond for a very long time. Calcite from the water crystallizes horizontally along the surface of the water at the wall. Very impressive is a single stalagmite, which is located right in the middle of the tour path, called Riesensäule (Giant's Column). It has an extraordinary symmetry and a palm trunk like form. Unfortunately its location in the middle of the path means that all visitors touch it. This resulted in traces like polished spots and black and brown stains. The oil which is produced by the human skin for protection, destroys the water film on the stalagmite and thus withholds a further grow for decades. 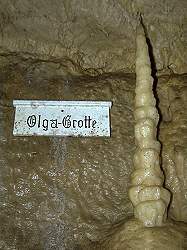 And the stalagmite is only a part of its original height as the passage was filled up for one metre to create a level tour path, so the lower part of the stalagmite was covered by gravel. In 2005 the cave had 100th anniversary as a show cave. To commemorate this, the cave was completely restored. 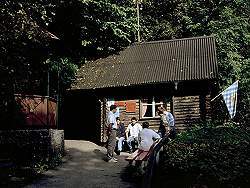 The electric light was redone, the paths were repaired and the small building at the entrance, which was used as hut for the cave guides and ticket office, was rebuilt. Probably the most important change was the removal of several chicken fences, which were once installed to protect the cave from the visitors. Now the speleothems look much better, as it is possible to see them without a filter.